What is a Children's Dentistry? 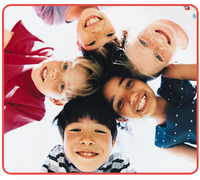 Well, simply put, it is the specialty of dentistry dealing with the oral health of children. More specifically and officially, it deals with both the primary and comprehensive preventive and therapeutic oral health care of children from birth to age 21 including those with special health care needs such as Cerebral Palsy or Down's syndrome. It is the only specialty in dentistry that is age defined, not procedure defined. In fact the official name is Pediatric Dentistry. It is one of the recognized specialties of dentistry. Our national organization is the American Academy of Pediatric Dentistry. When your child is sick you take your child to a Pediatrician. So, in Medicine, there is Pediatrics. In Dentistry, there is Pediatric Dentistry. Originally, we Pediatric Dentists were called "Pedodontists" and we practiced "Pedodontics". Some people got confused with the name and would, from time to time think we were foot doctors! So, they changed the official name so there is no confusion. Since we provide comprehensive care that means we do a little bit of everything. When a child or teen comes into our office, we will often clean the teeth, take diagnostic x-rays, apply preventive fluoride treatments and give oral hygiene instructions. If we find a problem, we will restore a tooth with a filling or a crown. If the need is there, we may have to remove a tooth or do some other kind of oral surgery. Part of the care we provide is orthodontics or "braces." 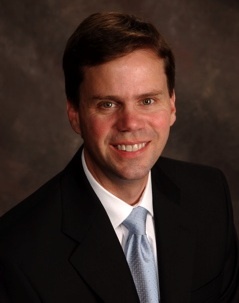 Although, in our office, we have an orthodontist on staff that handles most of our patient’s orthodontic treatment. Pediatric Dentists are trained to do braces as well. And yes, we see teens up to the age of 21. We even have patients older than that if they are still in University and not on their own yet. Much of what a Pediatric Dentist is known for is our behavior management skills. Somehow, we have to get a three year old child to sit still, lie down, open his mouth, allow an anesthetic injection, remove or wash out decay, and place fillings all without moving around or crying. Well, that's the idea anyways. Hey, I do it every day, but it's not always easy. With training and experience, we use the most likely methods to achieve the desired goal. Sometimes it's just talking with a child or guiding him through a procedure. Sometimes pharmacologic medications or laughing gas helps out. Sometimes there is just no way to do what we need without going to the hospital and completing extensive treatment with the patient under general anesthesia. So, you can see, there is a fine art of treating the patients dental condition, but doing it in a manner that is as easy as possible, accommodates parental preferences and does so in a cost effective manner. I just have to say, many people and dentists too say how difficult it must be to deal with the kids all day. Well, I'll tell you the kids are easy, it's the parents that usually more difficult to deal with. Hey, in Pediatric Dentistry, it's not all about drilling and filling, brushing and flossing. It's about caring about the children behind those wonderful smiles! I am sorry to hear of your child's accident. As you did not mention his age, I will answer this way: If it was a baby tooth that is turning dark you are likely ok, if it is a permanent tooth then I am more concerned about the darkening. I have a post on the blog just about this subject. I think this will link to it: My Child's Tooth is Turning Dark! I see all shades of gray, so to speak. It can be just a little gray just when the light hits just right or it can be a really purply dark color. Thanks. He is two years old. Your info really helped! My children's dentist just recently told us to give our children a fluoride wash. After telling a friend she told me her dentist said that was a bad idea because fluoride has been linked to childhood leukemia. What should I do? I've never heard of anything of the kind in the scientific and dental literature. If you stick to multiple peer reviewed long term controlled studies over many years you will get as reliable an answer as is possible. Even well educated well intentioned people do not have all the information, that's why there are whole professions devoted to providing the best answers. I base my decisions on the best possible researched information. Let's put it this way, I give my own children fluoride treatments in the office and fluoride toothpaste at home and I recommend rinses and varnishes when indicated to my patients. I don't do many permanent porcelain crowns till children have finished growing, usually in the later teens. Each case is different however. I very much disagree with the concept that children should fear dental treatment or should be made to be uncomfortable at the dentist. My experience is that if kids have a generally good time at the dentist they will take better of their teeth and get regular dental care. I cannot say as to specific treatment, but I usually (not always) but almost always, use nitrous oxide for operative dentistry especially if the child is a little anxious. There is a lot of info on this blog that you may want to spend some time reading about. I encourage you to spend some time checking out this information. I think you would find it enlightening. One of my 4 year old daughter's front teeth is badly decayed, it has also affected the one next to it. Her dentist wants to leave the tooth to fall out on its own, will it affect the permanent tooth and should he be doing something to protect the tooth like a crown? I am a bit concerned about doing nothing with it when the damage is so bad. Sometimes I will leave a decayed tooth if I think it will not cause problems. However, I would ask when the tooth will natuarally fall out. If it's an upper front tooth it will likely not fall out till she is 7 years old or more. I would consult a pediatric dentist if you have not already. My son had an accident where he dislodged one front baby tooth and lost the other, the dislodged tooth was decayed but the dentist did not remove it as my son was already distressed and he thought this was unnecessary on subsequent visits. The tooth has fallen out naturally but the permanent tooth has an imperfection like a small hole in the enamel, I called the dentist, he is going in tomorrow, the dentist believes it is due to the dental trauma, but could it be due to the decay, which is more likely. I believe that because the tooth was dislodged the permanent tooth came in directly behind the decayed tooth could this mean it is decay but the baby tooth came out before the permanent tooth erupted so is this likely as it was still in the gum, or could the root of the baby tooth been touching the tooth and decayed it? See what he says. You also might want to read my post on "White spots on teeth enamel hypoplasia"
i have an 8 year old son and recently took him to the dentist and found he has 7 cavities... im just curious on the chances of them spreading to his adult teeth if they were to be left. it just seems like a shame to pay for the expenses for them to fall out in a year.... thanks. Depends on where the cavities are located. Obviously he is at risk for cavity formation. Please take note of tooth eruption charts. Many baby molars do not "fall out" till 12 years of age. See my post on They are just baby teeth, why fix them? and other related posts. I cannot say, but highly unlikely that a permanent tooth is mistaken for a baby tooth. Some back (milk) molars do have large roots if removed early, but no, a permanent molar has very large roots and crown IMOP. BTW, I always try and get x-rays before treatment. Some kids though, that is not possible due to behavior or other reasons. I just graduated from high school a year early and want to pursue my long time interest in becoming a pediatric dentist. I've been admitted to UC Irvine Honors Program and hope to follow through with their pre dental program. My question is regarding volunteering and internships for those who have just finished high school. Throughout high school I've petitioned my dentist to let me volunteer or shadow at his office and got repeatedly turned down. Do you have any suggestions or recommendations for someone my age? Or should I just wait until I finish a year in college so that I can join UCLA's summer dental internship program? As a side note, what was your undergraduate major? I know you can major in basically anything if you fulfill the pre-reqs, but I'm more inclined towards the sciences. Do you think a biochemistry major would prepare me well for dental school? I am happy to hear you are considering dentistry and Pediatrics in particular. I majored in Biology and Minored in Chemistry. Biochemistry is certainly an excellent major choice if you like it. I loved Biochemistry. If you made A's in that, I am sure it would be good for you. Doing research is also a big plus once you get he opportunity. Don't get too hung up on the major, we had a History major accepted in my class. All that really matters is getting the requirements that are needed (which almost add up to a Chemistry or Biology major). and--good grades or an improving grade profile. Do something you like, something you are good at, and something that might open other doors if needed. Please read more here on the blog on the posts (and comments and responses) to similar questions I have had over time on the blog here. If you dentist is not keen on letting you shadow, I'd ask another dentist. Make sure you visit specialists and general dentists. If you are ever in Huntsville, you are welcome to shadow here if you let us know in advance! Thanks for your reply. I took AP Bio this year and tended to do best in Genetics and Biochemistry so that's where my idea came from. Also I wanted to know if being double jointed could affect my performance if I were to become a dentist. I am severely double jointed in my fingers and I don't have any problems grasping anything, but when I write timed essays I get a terrible case of writers cramp much worse than my peers. I really hope it doesn't get in the way of anything! I would not think double jointed would make any adverse difference. Fine motor coordination is more important then gross motor skills. Good luck. Let me know how it goes. 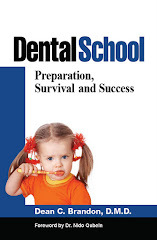 PS I am writing a book about how to survive dental school. Check back. May be out in about a year or sooner. Decay is common in young children. What treatment may be be indicated depends on the extent of decay. "root canals" are not too common in baby teeth bUt pulpotomies are. Read more on this blog about those procedures. A good pediatric dentist can help treat your child. My son fell on some brick stairs when he was 3.5 years old and chipped his front top tooth. He is now 5.5 years old and has a cavity in that tooth. It does not seem to bother him and the tooth is slightly discolored. He still eats things like apples and many other foods and it does not hurt him. Should I have the cavity filled or just let the tooth fall out? He has already lost his two front bottom teeth so I am assuming that it won't be long before his top teeth fall out. Upper front baby teeth usually fall out about 7 years of age. The lateral incisors at 8 to 9 years of age. I'd get a dentist's opinion as some kids are early and some are late in loosing teeth. If I thought a tooth will fall out in 6 months without any toothache, I would not restore it, just observe it if that is what the parent wanted. Otherwise, you have to see how deep the decay is, etc. Every time I need help with a dental question I come to this site! it really helps a lot and I just wanted to say, thank you! I HAVE A BIG DILEMMA!! My child is now 2 months away from being 2 years old, and her front tooth chipped in the end of September. I took her to the dentist and i was told that the her nerve was exposed so it will most likely catch an infection and will be taken out. They did a temporary filling but it fell out Oct 30th, Nov 2nd she got a new filling now Nov 7th, her filling fell out again. Now my question is about a dental crown? i don't want to her tooth pulled out because i am terrified it will affect her adult teeth. Her dentist recommended to pull the tooth out but she doesn't have an infection, she doesn't think a dental crown is a good idea because she is young and wont stay still. I am in desperate need of a second opinion!! From what you have described, the dentist seems to be correct in his diagnosis and recommendations. Leaving an abscessed (infected tooth) in can cause complications with the permanent tooth. Removal is often the best course of action.